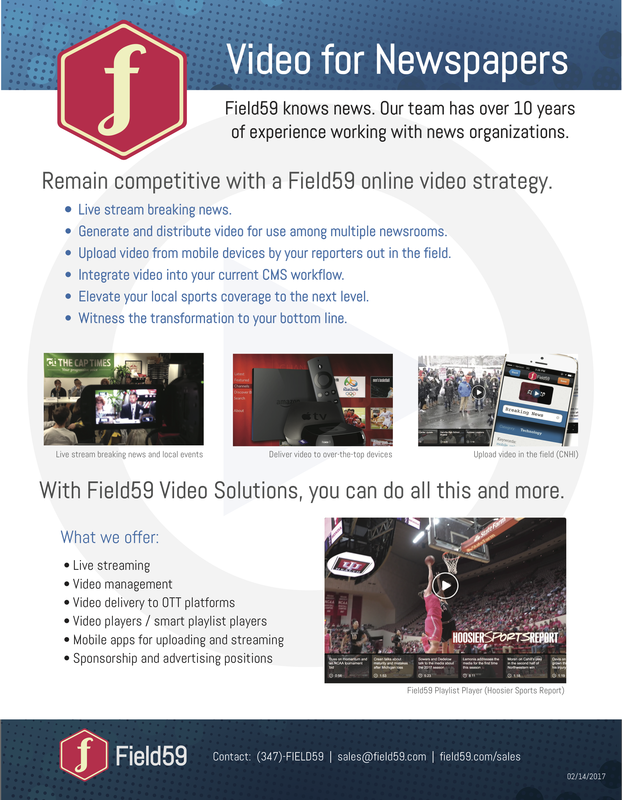 Field59’s video and live streaming statistics are powered by Google Analytics. If you or your organization already have a Google Analytics account, tell us your Google Analytics ID number and we can add that to your Field59 account and record to it. If you do not have an analytics account, but do have a Google email account, send that to us, and we will add you to your organization’s analytics property in Field59’s Google Analytics. (If you do not have a Google account email address, please create one and send your account email address to us using our online support portal). After your account is enabled, you can access your analytics by logging in at at http://www.google.com/analytics/. After you log in you are presented with the Account Home view. Click the link that is under your website domain (or if your Google Analytics account was set up by us, it may read “Field59, Inc.”). Doing so will take you to the Reporting view. (Please note the “Customization” tab is not used by default, but you could add your own reports). To access information about the users who are watching your site’s video or live stream, click the Audience button on the left side of the screen, then click Overview in the sub-menu that appears to view the Audience Overview screen. 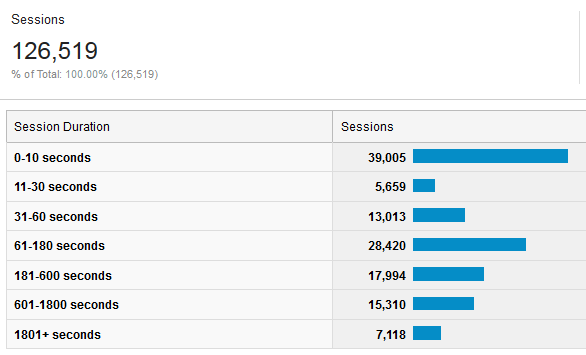 There are several metrics being tracked here, including Sessions, Users, Avg. Session Time (how long are users watching a video on average), and % New Sessions. 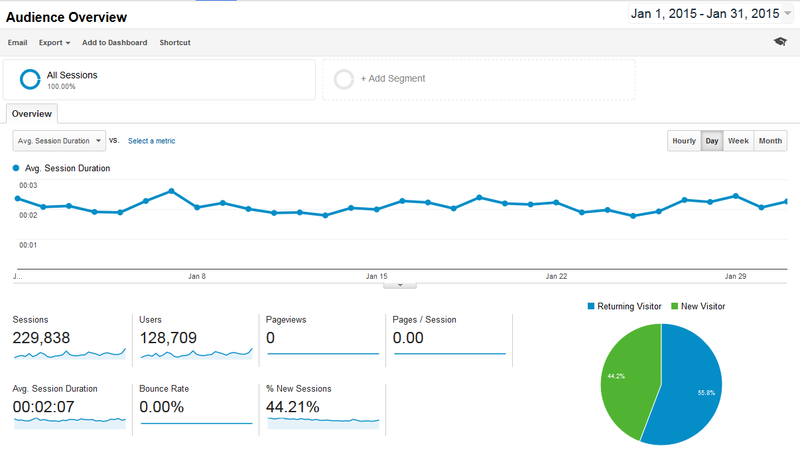 (We are not using the Pageviews, Pages/Visit or Bounce Rate metrics). You can view these by hour, day, week, or month. These time ranges can be changed in the upper-right portion of the screen. You can also check out Demographics, System information (Browsers, Operating System, etc) and statistics for mobile users by clicking the associated buttons in the Audience sub-menu on the left side of the screen. Under Audience > Behavior > Engagement, you’ll see how long users are spending watching video by duration. The other significant area of Google Analytics is under Behavior in the left-hand navigation, specifically the Events subcategory. The player is recording various “events” as a user watches a video, and you’ll find data pertaining to video views in this area. To access this information, first click the Behavior button on the left side of the screen, then click on Events, then Overview in the sub-menus. Under Top Events near the bottom left of the page, you will see Event Category, Event Action, and Event Label. 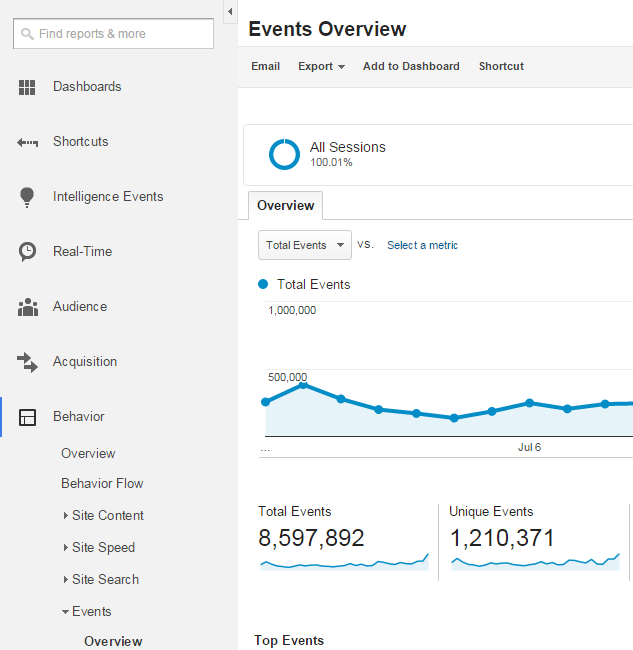 Event Category is your Organization’s name, so you’ll want to click on Event Action to view your video statistics. video_start: This represents your overall video views. The video_start metric is recorded every time a video begins to play. video_title: Whereas video_start is tracking views by their Field59 key identifier, the video_title metric seeks to log the title of a video upon playback, so it provides information on how many views by the titles of your video. Please note: the video_start metric should continue to be relied on as the overall total amount of views through the player. Also, please note video_title is not available for older v2 players. video_pause: The video_pause metric is recorded when the video is paused. video_resume: The video_resume metric is recorded when a user resumes playback after hitting pause. video_complete: The video_complete metric is recorded when a video finishes. It may be used as a rough approximating of videos that have been watched in their entirety, but does not account for user behavior such as skipping ahead in a video. video_stop: The video_stop metric is recorded when a video is actively stopped by a user. video_replayed: Any videos that are watched multiple times by a user are recorded here. Video_start is also logged for all replays. video_progress_25: The video_progress_25 metric is recorded when a video is watched one-quarter of the way through. video_progress_50: The video_progress_50 metric is recorded when a video is watched halfway through. video_progress_75: The video_progress_75 metric is recorded when a video is watched three-fourths of the way through. livestream_start: This is your overall live stream views. The livestream_start metric is recorded every time a live stream begins to play. livestream_stop: The livestream_stop metric is recorded when a video is actively stopped by a user. Please note viewers who exit the stream without stopping the player (i.e. close the browser window) are not recorded here. livestream_complete: The livestream_complete metric is recorded in scenarios in which the user has kept a player open past the point when a live stream is available. video_keyword: The keyword metric records every keyword associated with a video when it is watched. If you are using keyword-based playlists, you can measure playlist performance and relative popularity here. video_category: The category metric records every category associated with a video when it is watched. 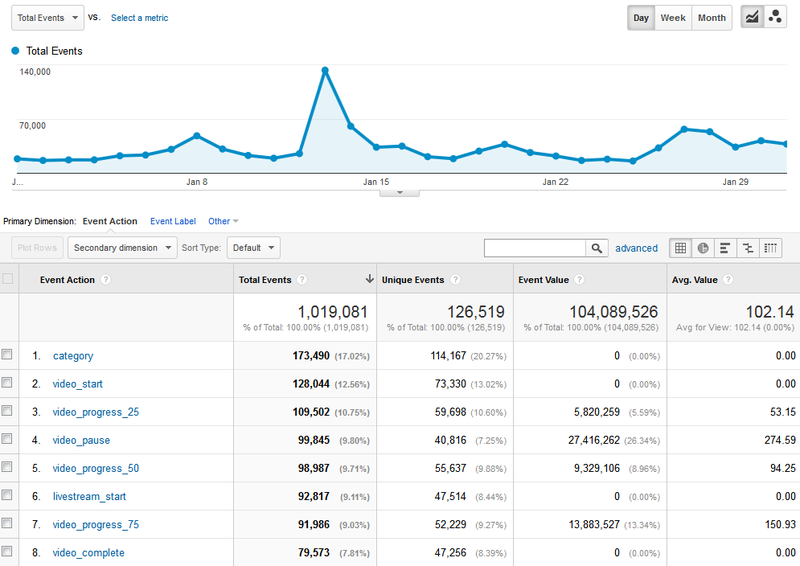 All of the above metrics from either the Visitors Overview or Content > Events can be added as widgets to the “Home” view. To do this, locate the Add to Dashboard button near the top of a given report. When you click it, you are provided options of available widgets. Choose the widget and Dashboard you want and select Add to Dashboard. You will be taken to your Dashboard view under Home with the newly added widget. Clicking on the title of any widget will take you to the full report view of the metric.